Dr. S. K. Sharma, MBBS, MS(General Surgery), is Head of the Institute of Renal Diseases & Principal Consultant Urologist at Alchemist Hospital, Panchkula. Prior to this, he had career stints as Professor & Head - Dept. Of Urology and Director- PGIMER, Chandigarh. Subsequently, he worked as Head of Urology at Silver Oaks Hospital, Chandigarh. Dr. S.K. Sharma started his career as a house surgeon at PGI, Chandigarh followed by a resident in surgery at PGI, Chandigarh. Thereafter, he joined AIIMS, New Delhi as a senior Resident in the department of General Surgery succeeded by residency in the department of Urology in AIIMS. Later, he worked as Pool Officer in Urology(CSIR), AIIMS, New Delhi. Consecutively, he had distinguished career as Professor & Head - Dept of Urology and then Director of PGIMER, Chandigarh. 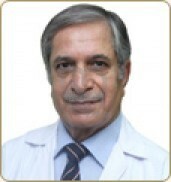 He has expertise in Urinary stone diseases, Trauma, Reconstructive Surgery and Uro-Oncology. Dr. Sharma has been regularly participating in the conferences orgainsed by the Urological society of India. He is very active in scientific research field and his research work has been published in peer reviewed International & National journals.